EECO Belt Drive (Dry) Power Units are designed with the pump and motor mounted on a sub-base located below the oil reservoir tank and is enclosed with sound isolation panels to limit transmission of noise during operation. The exposed control valve which is located above the tank allows for easy access to adjustments. A removable belt guard is provided to allow access to the pump and motor compartment for maintenance or adjustment of the drive system. Because the pump and motor are connected by means of “v”-belts and sheaves, the pump RPM can be adjusted, by selecting the proper ratio of pump and motor sheaves, to obtain the required flow. This system meets the specifications requiring that the motor and/or pump be mounted outside of the oil reservoir and that the pump and motor compartment be enclosed with sound isolation panels. The tank is constructed with a 12 ga. steel body, and removable 16 ga. cover, belt guard, and rear panel. Units are designed to fit through a standard machine room door. (see dimensional charts). A means for checking oil level is provided. 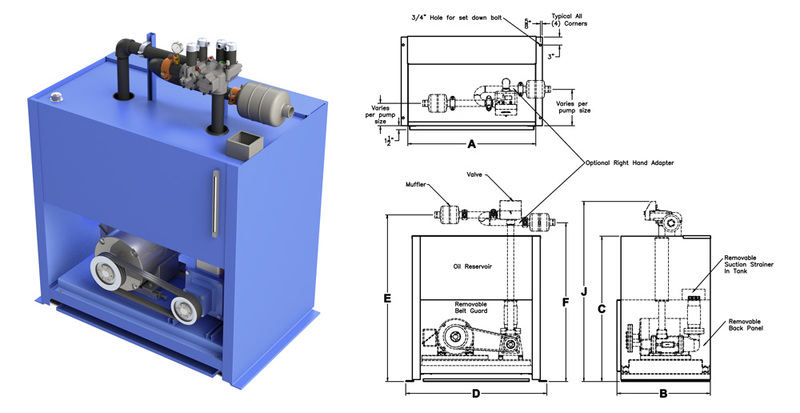 The pump and motor are mounted on a structural steel sub-frame that is secured to the main frame by means of isolation mounts to limit transmission of mechanically generated noise and vibration. Provisions are included to allow for easy adjustment of belt tension and alignment of sheaves. The outlet in the tank is protected by a removable strainer to allow for easy cleaning. A removable oil drip pan is provided. Mounting feet are provided with holes to allow for securing to the floor and Isolation Anchor Kit is also included for installation to the pit floor.